Over 3 million people in the United States, and over 60 million worldwide, have Glaucoma. The National Eye Institute projects this number will reach 4.2 million by 2030, a 58 percent increase. Why is Glaucoma Awareness Month so important? “Glaucoma is the leading cause of irreversible blindness and also referred to as “the sneak thief of sight” since there are no symptoms,” says Dr. Stewart Shofner. Glaucoma is a group of eye diseases that gradually steal sight without warning. Although the most common forms primarily affect the middle-aged and the elderly, glaucoma can affect people of all ages. 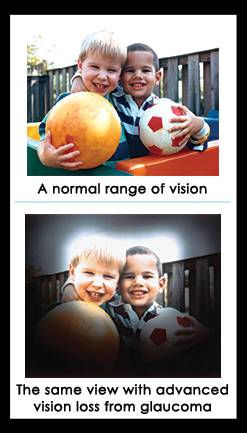 Vision loss is caused by damage to the optic nerve. This nerve acts like an electric cable with over a million wires. It is responsible for carrying images from the eye to the brain. Chronic open-angle glaucoma: This is the most common form of glaucoma in the United States. The risk of developing chronic open-angle glaucoma increases with age. The drainage angle of the eye becomes less efficient over time, and pressure within the eye gradually increases, which can damage the optic nerve. In some patients, the optic nerve becomes sensitive even to normal eye pressure and is at risk for damage. Treatment is necessary to prevent further vision loss. Learn more about specific types of glaucoma on our website. People of African, Asian, and Hispanic descent are at higher risk of developing glaucoma. Some studies indicate that diabetes, high blood pressure and heart disease may increase the risk of developing glaucoma. Also those that have experienced a severe trauma, such as being hit in the eye, can result in immediate increased eye pressure. Dr. Shofner recommends those at higher risk for glaucoma should have routine eye exams to prevent vision loss. According to the Glaucoma Research Foundation, 40% of vision can be lost without a person noticing. The best way to protect your sight from glaucoma is to get a comprehensive eye examination. Then, if your doctor diagnoses glaucoma, treatment can begin immediately. Check with if the necessary eye tests can be performed with your local eye doctor or schedule an appointment online at Shofner Vision Center.